Quang Nam (VNS/VNA) - The Tam Thanh art community village in Tam Ky city of Quang Nam province has been awarded the 2017 Asian Townscape Award for its colourful murals. Vice Chairman of the Tam Ky city People’s Committee, Nguyen Minh Nam, told Viet Nam News the award was announced at the 2017 Asian Townscape Awards session in Fukuoka city, Japan, on July 27. Nam said the prize was being awarded by UN-Habitat, Asian Habitat Society, Asian Townscape Design Society and Fukuoka Asian Urban Research Centre, and the ceremony will be held in Yinchuan city on September 28-29. “It’s a great honour for us. Efforts were made by local villagers, the city’s administration and artists nationwide,” Nam said. “We also expressed our thanks to the Korea Foundation Community Art Exchange Programme and Korean artists and volunteers for their decoration of the village with colourful murals on moss-covered walls in 2016,” Nam said. Tam Ky city and Tam Thanh commune launched the fishing village of Tam Thanh as a community-based art space for eco-tourism development. It’s also the first project in Vietnam that weaves art space into community lifestyle. The fishing village, with a population of 6,000, is known nationwide and by foreign tourists for the murals in Trung Thanh hamlet. 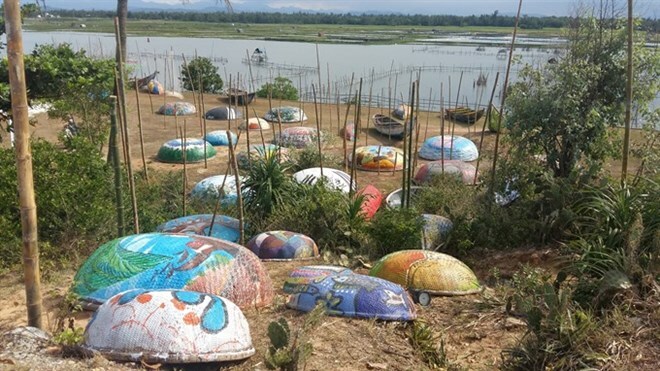 In March, artists from Singapore Technology and Design University, Vietnam’s Fine Arts Association, colleges in Hanoi and local painters started painting a coracle for an exhibition in Tam Thanh village. Artists also turned the old walls of 100 houses in the village into colourful murals, depicting portraits of villagers, local scenes and regional panoramas. Photographers from the Republic of Korea, the Philippines and Turkey flocked to take photos at the village for an exhibition in Seoul and other cities last year. Tam Thanh village has a 6km coastline and a tranquil environment, and tourists can easily connect from there with Tam Ky and Hoi An city. It hosts around 500 visitors each day, and 2,000 tourists on weekends.